Wonderful British poster for classic 60s sci-fi. Reynold Brown's artwork looks best on this, far rarer than its US counterpart, UK Quad. Fantastic folded (as issued) unrestored condition. You'd be hard pressed to find another in better condition... Even if you had a time machine! Very little paper-loss on left centre cross-fold. Couple of pin-holes in margins and small creasing, nicks on edges. Little surface loss and tape mark on left hand margin. Otherwise in fantastic unrestored condition. 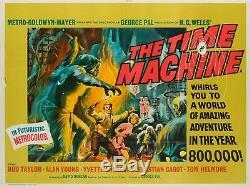 The item "Original The Time Machine, UK Quad, Film/Movie Poster 1960, Reynold Brown" is in sale since Monday, April 9, 2018.